When Mr. Gilchrist [the hairdresser] opened my aunt’s head, …its effluvias [bad odor] affected my sense of smelling disagreeably, which stench however, did not surprise me when I observed the great variety of materials employed in raising the dirty fabric. False locks to supply the great deficiency of native hair, pomatum with profusion, greasy wool to bolster up the adopted locks, and gray powder to conceal at once age and dirt, and all these caulked together by pins of an indecent length and corresponding color. When the comb was applied to the natural hair, I observed swarms of animalculas [small insects] running about in the utmost consternation and in different directions, upon which I …asked …[Mr. Gilchrist] whether that numerous swarm did not from time to time send out colonies to other parts of the body? He assured me that they could not; for that the quantity of powder and pomatum formed a glutinous matter which… caught and clogged [them]… and prevented their migration. Here I observed my aunt to be in a good deal of confusion, and she told me that she would not detain me any longer from better company; for …the operations of the toilette were not a very agreeable spectacle to bystanders, but that they were an unavoidable evil; for, after all, if one did not dress a little like other people, one should be pointed at as one went along. -August, 1768 London Magazine. Quoted in Corson Fashions in Hair: The First five Thousand Years, pp. 337-338. You’ve probably heard of – or even used – the term “lousy” to refer to an unpleasant situation, but were you aware that it refers to the state of being infested with lice? “Louse” is the singular form of the plural “lice.” The continued popularity of terms such as “lousy” and “nitpicking” reflects the enduring legacy we’ve inherited from a long history of human lice infestations. A louse as depicted in Hooke’s Micrographia. Credit: National Library of Wales. Public Domain. Lice feast upon the blood from their reluctant hosts, and their rapacious bites make the scalp itch incessantly. During the colonial era, desperate hosts combated these voracious pests by cutting their hair short or shaving it off altogether! In the 1700s, the most popular hair styles for adults combined greasy pomade with by a liberal (and frequent) application of hair powder (often wheat flour-based). The resulting impenetrable pasty blend of lard and starch provided an irresistible condiment for pests of all kinds. Hair thus embellished demanded careful maintenance. The frequency of hair care depended upon individual preference, availability of a trusted hairdresser, the presence of pests, and how the hairstyle’s veneer of pomade-and-powder responded to the weather (hot weather and rain, for example, prove devastating). Combating pests was so stressful that many found wearing a wig (or ‘peruke’) less troublesome than maintaining one’s own hair. Wigs can be removed, cleaned, boiled, combed, and have requisite unguents applied by a hairdresser without the wearers being involved. A cleaned and dressed peruke was presented to its owner without the time and discomfort associated with having these procedures applied directly to his scalp. Until the later decades of the 1700s, wearing wigs was essential for most fine gentlemen. Women might wear wigs if some illness caused the loss or thinning of their own hair, but wearing them as fashion accessories was frowned upon for ladies during the 17th and much of the 18th centuries. Well-heeled ladies grew their own hair long and – especially in the final decades of the 1700s – piled it ever higher upon the top of their head. Architecture was even influenced by the tall styles of both men and women, as doorways became higher or arched to accommodate soaring headdresses. Whether part of a wig or confined to one’s own locks, prolific hair was fashionable and wool pads increased their towering heights dramatically. Purchasing separate lengths of curled hair to augment feminine hairstyles was especially popular among refined ladies. Thomas Jefferson purchased such curls for an esteemed female family member from a Williamsburg wig shop in 1770. 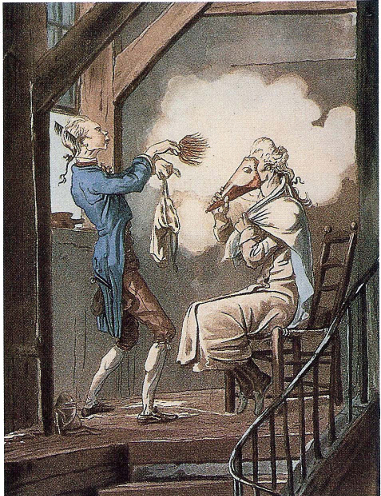 A satirical view of the “Coiffure à la Belle Poule.” Public domain. Credit: Henri Moreau/Wikipedia. Laborers, however, required practical hair styles that could withstand the strenuous environmental conditions and exertions of their physical tasks. The 18th century hairstyles of dedicated workers reflected the minimal time they possessed to style and maintain their hairstyles. These people wore their own hair in easy-to-maintain styles: under most circumstances they simply couldn’t afford the time, products, or talented hairdressers required of fancy hairstyles. The greasy pomade-and-powder enhanced styles of refined men and ladies attracted dust in addition to insects. Scalps were tickled by crawling insects, plagued by biting lice, and irritated by an accumulation of products: they itched! Men could reach under their wig for a quick scratch or, if alone, could remove their wig for a well-earned scrape. For those men and women who wore their own pomaded hair, a clumsy, direct manual scratching by hand disturbed their inflexible tresses. Head scratchers (or grattoirs), such as the one shown below, allowed people to itch their scalp while minimizing the damage done to their elaborate styles, stiffened as they are by layers of pomade and powder. The hairpins that festoon elaborate hairstyles also provided a means of relief: discretely shifting those hairpins back and forth across one’s scalp strategically satisfies itchy crowns. Of course, the lard-infused pomade attracted not only pore-clogging dust, but additional insatiable insects and even rodents. This head scratcher, or ‘grattoir,’ allowed its owner to scratch their scalp without disturbing their stiff, pomade-and-powder-encrusted hairstyle. It features a wooden handle and an ivory hand (inset), a popular motif in these essential tools. Kill no Vermin as Fleas, lice ticks etc. in the Sight of Others, if you See any filth or thick Spittle put your foot Dexteriously upon it if it be upon the clothes or companions, Put it off privately, and if it be upon your own Cloths return Thanks to him who puts it off. From servants to sovereigns, blood-sucking head lice were a nuisance for all. Speaking of itchy crowns, King George III encountered a louse on his dinner plate! He blamed the kitchen staff for this uninvited dinner guest. “Is this Your Louse?” King George III queries a member of the kitchen staff after discovering a louse on his dinner plate. Thomas Rowlandson, 1787. Lewis Walpole Library. The eggs of these pests, called nits, are really small. Nitpicking is tiresome. Fine-toothed combs, just like those found at Ferry Farm (see photo), enjoy millennia-long application in the battle against these parasites worldwide. But, some cautioned that combing hair caused headaches if done too frequently! Combing once every week or two was ideal. Between fear of water, ineffective soaps, and an aversion to combing, hairstyles might go weeks or even months without being combed. 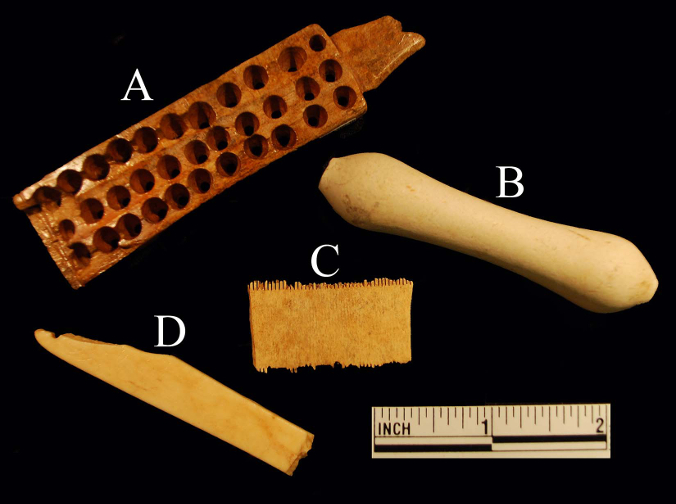 These bone grooming comb fragments are from Ferry Farm. Their delicate teeth are missing because they have broken off and decayed over time. Keeping hair short, or shaving it altogether, was an effective deterrent against these pests. Unlike one’s own hair, wigs could be boiled and baked to ensure lice and their eggs (‘nits’) are destroyed. However, without proper maintenance, wig hair could host just as many pests as natural hair. In 1664, Samuel Pepys was dismayed to discover that the brand new peruke he purchased was infested with nits and lice. Hairstyle historian Maria Jedding-Gesterling claims that some desperate hirsute fashionistas tucked insect traps within their towering coiffures. Fabrics soaked in blood or honey lured hungry fleas into these pierced ivory traps. And for those people who had surrendered in the war against insects, wearing clothing that was flea colored provided a savvy strategy for hiding those intimate, tiny bedfellows. Flea-colored clothing became popular in the mid-1770s, even among the Court at Versailles. Is your head itching? Mine is! Fisher, Leonard Everett. 2000 . The Wigmakers. Benchmark Books, New York. Galke, Laura. 2015. Wigs, 1715-1785. In Clothing and Fashion: American Fashion from Head to Toe, Volume 1, Pre-Colonial Times through the American Revolution, edited by Jose Blanco F., and Mary D. Doering, pp. 301-303. ABC-CLIO, Santa Barbara. Huey, Lois Miner. 2014. Ick! Yuck! Eew! Our Gross American History. Millbrook Press, Minneapolis. Hunt-Hurst, Patricia. Wigs, 1776-1819. In Clothing and Fashion: American Fashion from Head to Toe, Volume 2, The Federal Era through the 19th Century, edited by Jose Blanco F., and Patricia Hunt-Hurst, pp. 267-268. ABC-CLIO, Santa Barbara. Trasko, Mary. 1994. Daring Do’s: A History of Extraordinary Hair. Flammarion, Paris. Vincent, Susan J. 2009. The Anatomy of Fashion: Dressing the Body from the Renaissance to Today. Berg, New York. Arnold, Janet. 1970. Perukes and Periwigs. Her Majesty’s Stationery Office, London. Bristol, Douglas Walter, Jr. Knights of the Razor: Black Barbers in Slavery and Freedom. Johns Hopkins University Press, Baltimore. Brown, Kathleen M. 2009. Foul Bodies: Cleanliness in Early America. Yale University Press, New Haven. Corson, Richard. 2012 . Fashions in Hair: The First Five Thousand Years. Peter Owen, London. Cox, J. Stevens. 1965. The Wigmaker’s Art in the 18th Century. George S. MacManu Company. Philadelphia. Cruse, Jen. 2007. The Comb: Its History and Development. Robert Hale, London. Durbin, Gail. 1984. Wig, Hairdressing and Shaving Bygones. Shire Publications, Ltd. Aylesbury, Bucks. Festa, Lynn. 2005. Personal Effects: Wigs and Possessive Individualism in the Long Eighteenth Century. Eighteenth-Century Life. 29(2):47-90. Galke, Laura. 2018. Tressed for Success: Male Hair Care and Wig Hair Curlers at George Washington’s Childhood Home. Winterthur Portfolio 52(2):1-51. 1988 Regency, Rococo and Louis XVI (1715-1789). In Hairstyles: A Cultural History of Fashions in Hair from Antiquity up to the Present Day, edited by Maria Jedding-Geserling. Hans Schwarzkopf, Hamburg. Pp. 119-148. Kern, Susan. 2010. The Jeffersons at Shadwell. Yale University Press, New Haven. Kwass, Michael. 2006. Big Hair: A Wig history of Consumption in Eighteenth-Century France. The American Historical Review 111(3):631-659. Moore, William. 1780. The Art of Hair-Dressing and Making it Grow Fast, Together With a Plain and Easy Method of Preserving it; With Several Useful Recipes, Etc. Printed for the Author by J. Salmon, in Stall-Street, Bath. Perry, Gill. 2004. Staging Gender and “Hairy Signs:” Representing Dorothy Jordan’s Curles. Eighteenth-Century Studies 38(1):145-163. Pointon, Marcia. 1993. Hanging the Head: Portraiture and Social Formation in Eighteenth-Century England. Yale University Press, New Haven. Richardson and Urquhart. 1778. The New London Toilet: or, a Compleat Collection of the Most Simple and Useful Receipts for Preserving and Improving Beauty. Printed for Richardson and Urquhart, London. Sherrow, Victoria. 2006. Encyclopedia of Hair: A Cultural History. Greenwood Press, Westport, Connecticut. Stewart, James. 1782. Plocacosmos: or the Whole Art of Hair Dressing; Wherein is Contained, Ample Rules for the Young Artizan. Printed for the Author, No. 12, Old Broad-Street, London. Warwick, Edward, Henry C. Pitz, and Alexander Wyckoff. 1965. Early American Dress: The Colonial and Revolutionary Periods. Bonanza Books, New York. 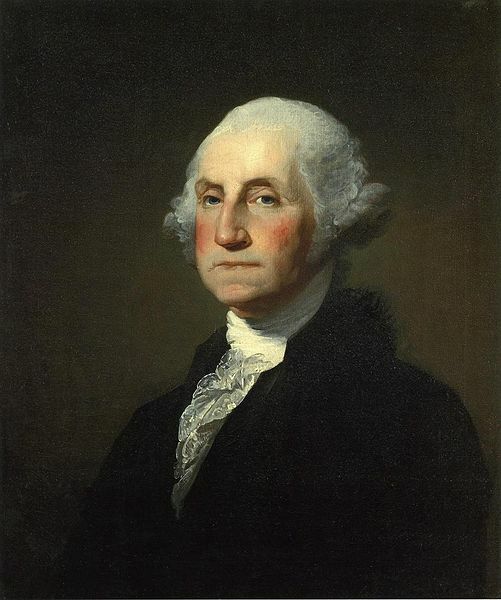 “I went in to the Bed as they call’d it when to my Surprize I found it to be nothing but a Little Straw—Matted together without Sheets or any thing else but only one Thread Bear blanket with double its Weight of Vermin such as Lice Fleas &c,” wrote 15-year-old George Washington in his Journal of my journey over the mountains kept during one of his earliest surveying trips to Virginia’s frontier. A flea viewed through a microscope and drawn by Robert Hooke for his “Micrographia or some physiological descriptions of minute bodies made by magnifying glasses with observations and inquiries thereupon” (1655). Credit: National Library of Wales. Public Domain. A louse as depicted in Hooke’s “Micrographia.” Credit: National Library of Wales. Public Domain. These insect armies certainly had plenty of places to hide. Beds of the 18th century were constructed of wood frames lashed together with rope. The humblest of beds contained numerous nooks and crannies that served as home to numerous creepy crawlies. Wealthier homes were not safe from infestation. Large canopy-style beds frequently decorated with ornate cravings greatly increased the number of hiding places for vermin. Sheets, blankets, quilts, and bed curtains added more hiding places. Finally, the mattresses themselves were usually filled with straw or, for the more well-to-do, with feathers that bugs found to be soft and enjoyable homes. 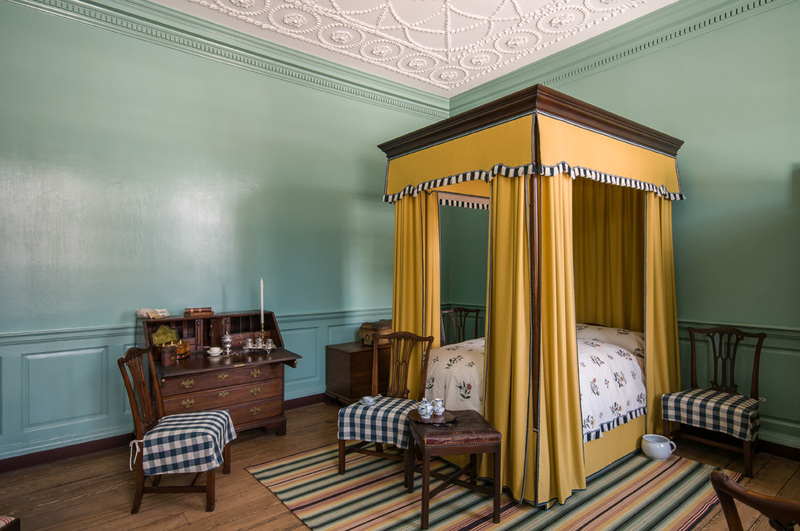 Bed furniture, curtains, canopy, and coverings could become infested with variety of insects common to an 18th century plantation in Virginia. Housekeeping guides of the time included instructions on how to make concoctions to eliminate bugs from one’s bed. The Compleat Housewife, or, Accomplish’d Gentlewoman’s Companion by Eliza Smith and The Art of Cookery Made Plain and Easy by Hannah Glasse, two popular guides to proper housekeeping in the 18th century, included recipes for concoctions aimed at killing bugs in bedding and bed furniture. Both of these books were in Fielding Lewis’ library at Kenmore. 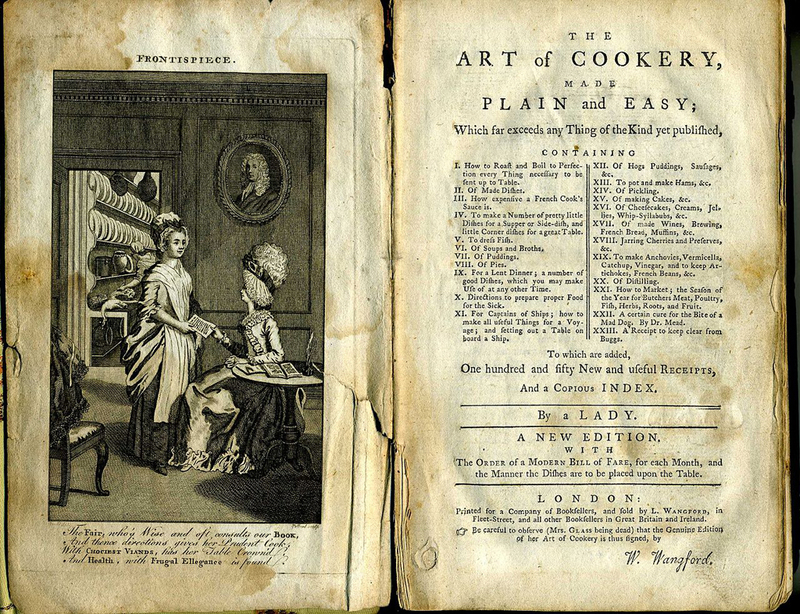 Title page and frontispiece to Hannah Glasse’s The Art of Cookery Made Plain and Easy (c. 1777). Glasse’s recipe for “How to keep clear from Bugs” advised closing up the room tightly by hanging blankets over shut windows, doors, and across the mouth of the fireplace. Then, one opened any closets, cupboards, drawers, and boxes. Bedding and mattresses were pulled from the bed and hung over chairs and tables around the room. In a broad earthen pan in the center of the room, one placed a chafing-dish full of lit charcoal to which was added brimstone (sulfur) and, if available, “India pepper.” This pepper was a source of capsaicin which served as an insect repellent. The sulfur suffocated the bugs and, frankly pretty much anything else in the room. The cautions within the recipe about leaving the room quickly and about reentering the room after several hours are lengthy. The process left an irritating residue so, before it was safe to reoccupy the room, it had to be cleaned first. Lastly, both books included one other “Effectual Way to clear your Beadstead of Bugs” specifically for use on bed furniture. This recipe called for mixing quicksilver (poisonous mercury!) with eggs and then spreading the goo throughout the cracks, crevices, and joints of the bedstead and leaving it there. While all of these treatments would have been effective against the bugs, they were quite dangerous to humans as well. The reprieve provided from infestation was probably relatively short-lived for the recipes all suggested repeating the process as needed. 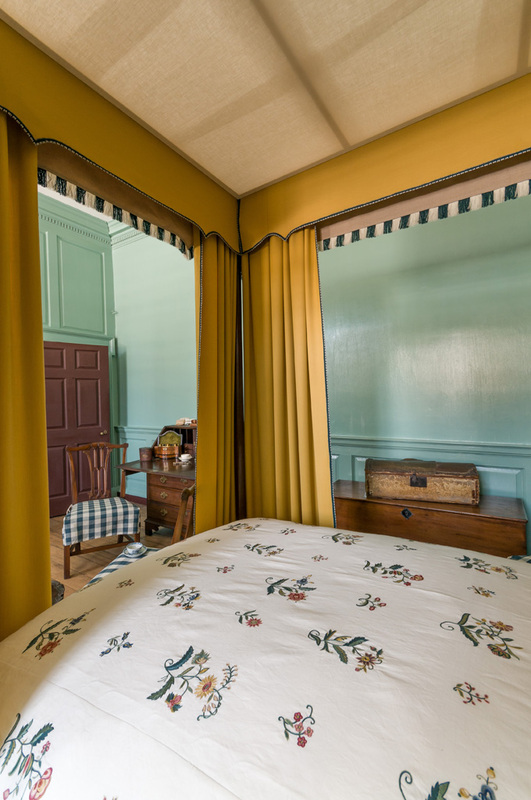 Even with the help of Hannah Glasse or Eliza Smith, lice, fleas, and bedbugs were an ever-present and inescapable part of the 18th century life and could be found in the fine bed in Fielding and Betty Lewis’s chamber as well as in the dirty straw mat of the young surveyor George Washington.